The talent pipeline for the Capital Region’s tech sector is becoming more diversified, with local colleges and institutions awarding 35.8 percent more STEM degrees to minorities1 over the past five years, according to a Center for Economic Growth analysis of data from the Integrated Postsecondary Education Data System (IPEDS). 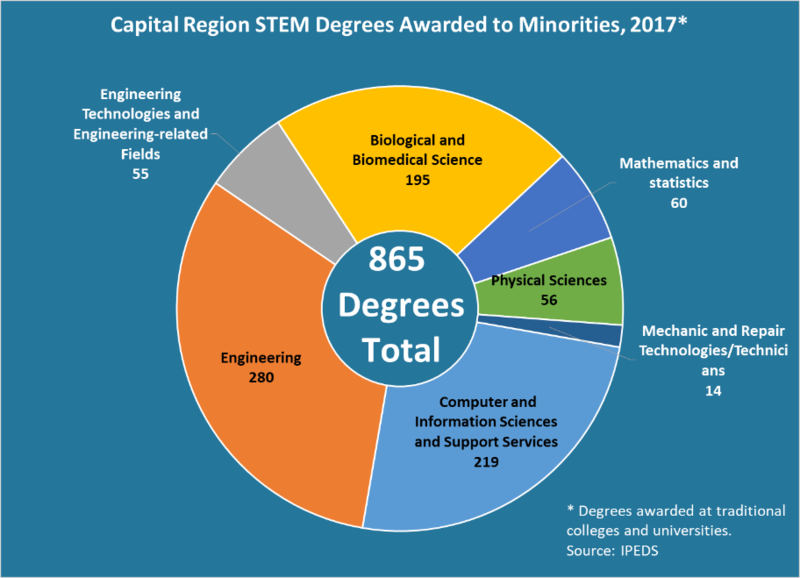 In 2017, 17 of the region’s traditional colleges and universities awarded minority graduates with 865 degrees in eight major STEM fields2, compared to 637 in 2013. The two distance-learning institutions based in the region3 awarded an additional 246 STEM degrees to minorities in 2017, up 44.7 percent from five years earlier. Together, these institutions awarded 1,111 STEM degrees to minorities in 2017, or 23.8 percent of all STEM degrees. At traditional institutions, the biggest increase was seen with STEM degree recipients of two or more races, up 73.2 percent over five years to 123. During that period, the number of STEM degree awards were up by 58.7 percent to 246 for Hispanics, 22.1 percent to 342 for Asians and 18.2 percent to 162 for blacks. The fastest-growing STEM field among minority graduates of traditional institutions was computer and information technology sciences, which saw a 160.7 percent increase in degree awards over the past five years. Primarily driving that growth was more Asian, black and Hispanic graduates at the University at Albany. During the five-year period, the biological and biomedical science and mechanic and repair technologies STEM fields both saw declines in degrees awarded to minorities, 11.8 percent and 12.5 percent respectively. In 2017, the region’s traditional institutions awarded 374 degrees in STEM-related health fields, up 7.5 percent from five years earlier. The largest growth among minorities receiving degrees in this field were Hispanics (up 34 percent to 71) and Asians (up 13.6 percent to 142). 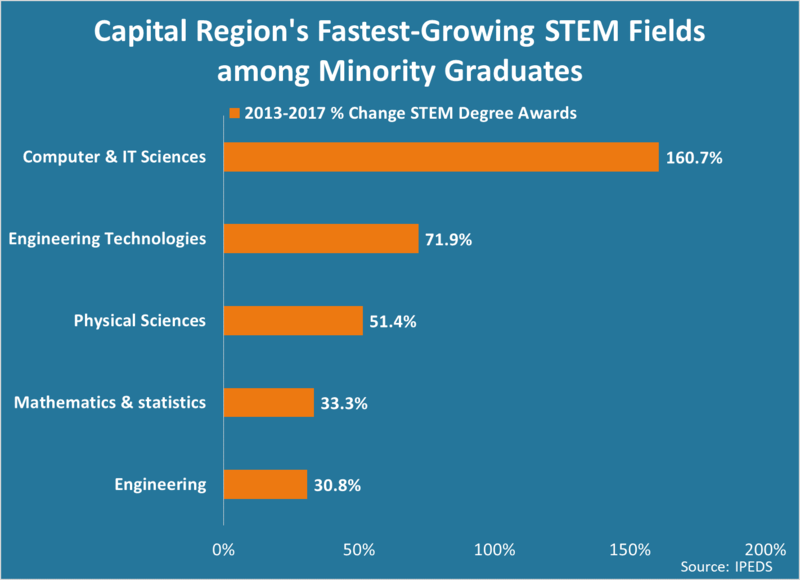 With many tech companies interested in developing and maintaining diverse offices, the Capital Region’s intensified minority STEM degree output is important to CEG’s worldwide industry attraction efforts. However, with data from Economic Modeling Strategies Int. (EMSI) showing that 15.9 percent of the region’s R&D to Commercialization Cluster consisting of minority workers – compared to 31.4 percent for the nation – this STEM degree award trends needs to further intensify along with efforts to retain the talent graduating from local colleges and universities. • Manufacturing Pathways: As the administrator of a $250,000 KeyBank grant, CEG is helping marketing Hudson Valley Community College’s manufacturing boot camp program and Schenectady County Community College’s new Certified Production Technician program to students from low- to moderate-income households. • JumpStart: Supported by a $110,000 KeyBank Business Boost & Build grant, CEG and two local partners are working to grow the regions ranks of minority and women-owned business enterprises (MWBEs) and disadvantaged small businesses. Through this program, powered by JumpStart, CEG is holding and sponsoring events and workshops for these targeted businesses and providing them with technical assistance. • Girls in STEM: Each year, CEG partners with AT&T, HVCC, Saratoga County Prosperity Partnership and other local groups to introduce local girls in grades four through eight to exciting STEM careers and fields. This annual event attracts hundreds of girls and features hands-on workshops facilitated by leaders and educators in STEM professions. 1 Non-white degree awards. Does not include counts of unknown race/ethnicity or nonresident aliens. 2 STEM fields include: Computer and Information Sciences, Engineering, Engineering Technologies and Engineering-related Fields, Biological and Biomedical Sciences, Physical Sciences, Science Technologies/Technicians, Mechanics and Repair Technologies/Technicians and Mathematics and Statistics. 3 SUNY Empire State College and Excelsior College.